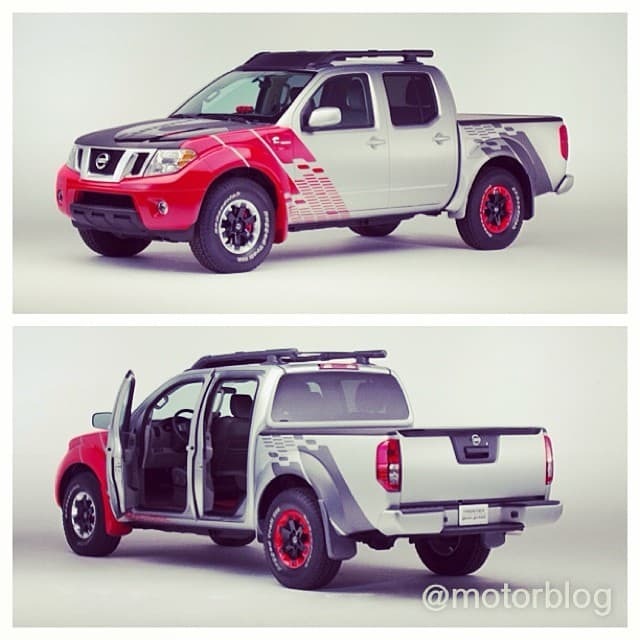 The Nissan Frontier Diesel Runner is a concept project truck built by Nissan and featuring a 2.8 liter, 1-4 turbodiesel built by the Cummins Company, a very well known builder of engines. While cranking out about two hundred horsepower and over three hundred fifty pound-feet of torque, it still manages to increase fuel efficiency by thirty five per cent when compared to the usual 4.0 gasoline V-6 engine. With a ZF-sourced eight horsepower 70 eight-speed automatic transmission, the Frontier Diesel Runner has about the same capacity to tow as the gasoline powered Frontier. The exterior of the Diesel Runner is similar to the Frontier Desert Runner but there are a few differences. The Frontier Runner boasts a graphics package that really catches the eye, along with painted wheels. The hood is made up of transparent plastic that has been finished in a matte-grey color with the exception of the large Cummins logo, complete with the company name prominently in the middle of it. This allows the engine bay containing the diesel engine to be admired without even having to raise the hood. The black interior of the Desert Runner has been replaced by red trim and carpet. The most pronounced change, however, is the addition of three auxilary gauges that have been placed on the top of the center console. A temperature gauge for the transmission, a pyrometer, which measures exhaust gas temperature and a boost gauge all help keep the driver totally aware of what’s going on under the hood. With its flashy good looks, powerful towing and hauling capacity and excellent gas mileage, the Nissan Frontier Diesel Runner is getting a lot of attention, with many people stopping to check out the powerful engine and fantastic graphics. The automatic transmission makes it as easy to drive as it is to look at. The partnership between Nissan and Cummins isn’t a new development, they have combined their talents before with excellent results. In the Frontier Diesel Runner, they have another successful collaboration that they can be proud of. With the reputation of durability that Nissan enjoys and the Cummins history of excellence, the Diesel Runner is expected to be a popular vehicle.